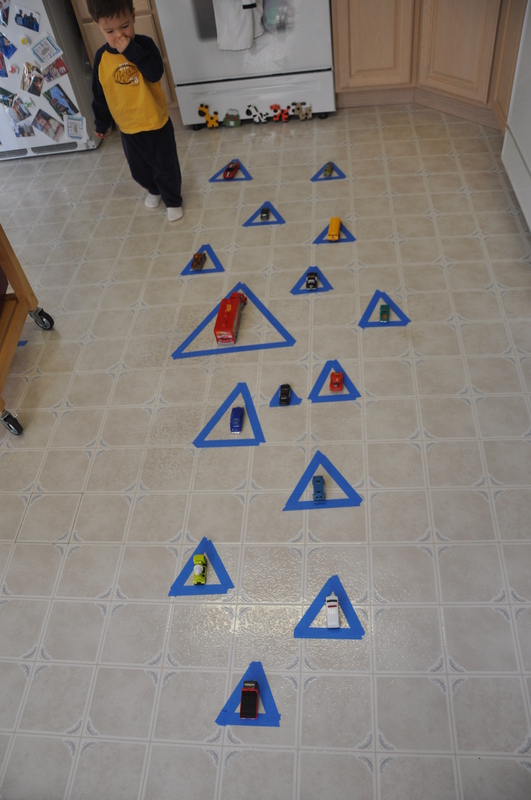 Floor Shapes: We taped triangles up and down our kitchen floor. I got the first few started and then J helped me by decided if the triangle should be big or little and making sure I completed the triangle’s three sides. I repeated again and again that triangles have three sides and we counted as I placed each side down. This is my winter/rainy day version of sidewalk chalk. If you read my sidewalk chalk post, you’ll know that I like to have something out as a consistent reminder of our weekly lessons. Painter’s tape works well when we can’t get outside! When the triangles were all completed, we traced them with our fingers, we walked and “jumped” across the triangle path, we drove cars around the sides of the triangles and we filled each triangle with one of his Matchbox cars (a good reminder for the number one). 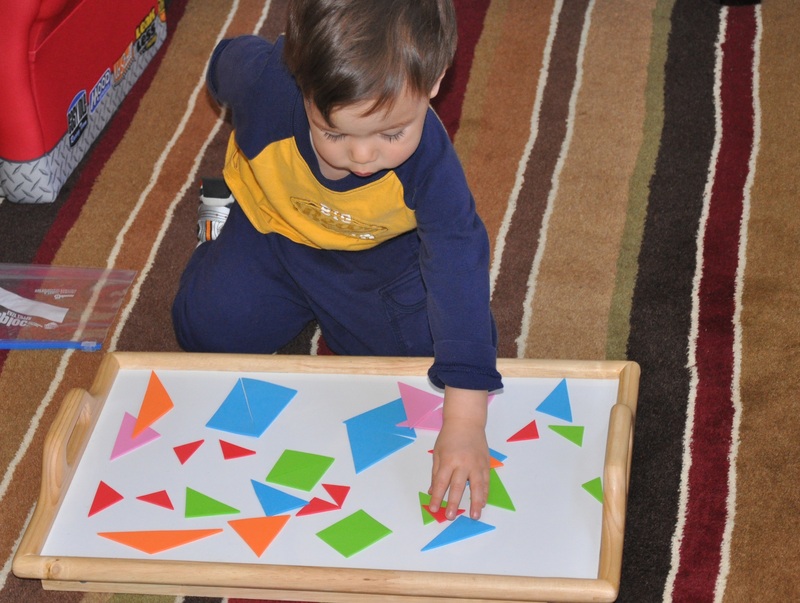 Triangle Building Shapes – This is a simple activity and so easy to prepare. All I had to do was cut out a handful of foam triangles in different sizes and colors. I showed J how to lay the triangles next to each other to create pictures and designs (basically build with triangles instead of blocks). He mostly wanted to match the triangles (same size and color) which was perfectly fine with me. 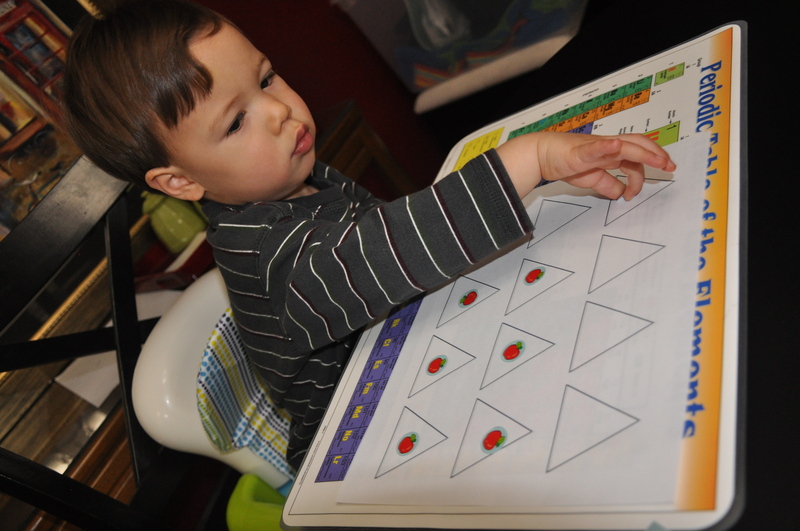 The point was to give him lots of visual reminders of a triangle and that was accomplished. You could do this activity with felt or even construction paper (and glue the shapes onto paper). I saw something similar in a learning store, but the shapes were magnetic. I loved that idea, but I was too cheap to buy them and didn’t have time to make them! Stickers in Triangles – I gave J a piece of paper filled with triangles and had him place one sticker inside each triangle. This activity is a huge winner. I once read about giving toddlers spaghetti pasta to fit inside empty spice containers in the “Toddler Busy Book”. I tried this first (with an empty water bottle since he was too young to fit the spaghetti in the tiny spice holes) but the spaghetti kept breaking and then I was worried he’d try to eat the pieces. It just didn’t work with J so young. So I changed the activity and gave him pipe cleaners with the empty bottle instead. I twisted the pipe cleaners in half so they were more sturdy and bent the ends around so they were safe. J loved loved loved this. It is definitely in the top 10 toys he owns. I now include it when making a Busy Box for 1 year olds. 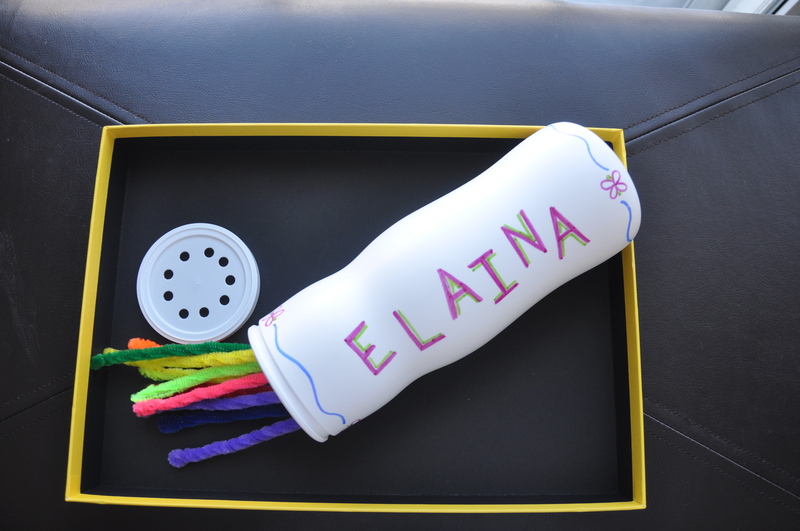 It’s a great activity to help little ones practice motor skills. 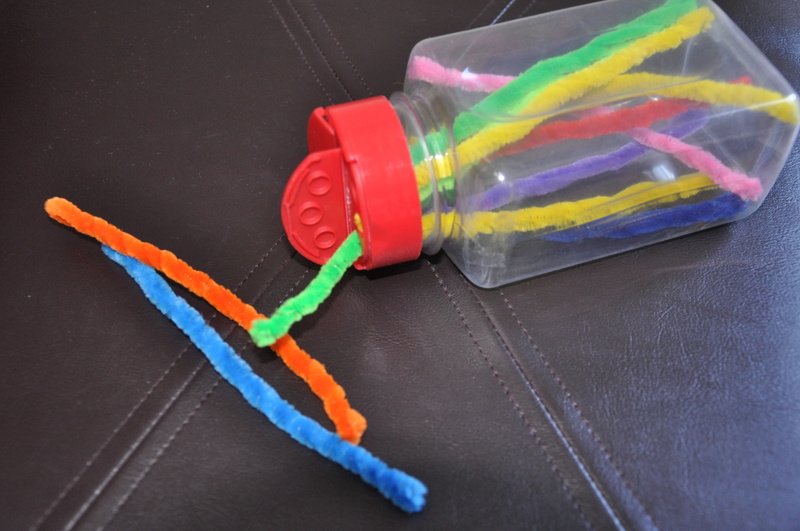 The length of the pipe cleaners makes it more difficult to fit inside the bottle than a puff ball or anything small enough to fit into their hands. J often tried to hold the bottle in one hand and the pipe cleaner in his other hand so it required steady hands (something he did not have at first!) As he’s gotten older and in better control of his muscles I’ve decreased the size of the mouth on the bottle. He now uses an empty parmesan container with the holes in the lid or a plastic lid that I punched holes into. I’ve also seen an activity online that colored around each hole to encourage their toddler to match the colors during the activity (though I can’t remember where!). I liked that idea, but haven’t used it yet. It would definitely increase the difficulty. It’s funny how we don’t realize all the skills we had to master in order to do things like pouring, sorting, threading, etc. It’s fun watching J learn these things. This is one of J’s favorite activities between ages 11 months and maybe 18 months. It’s a perfect plane activity since it keeps him occupied for so long and is so light to carry while traveling. In fact, he just enjoyed this toy on our plane ride this morning at 22 months. Again it’s light, keeps them busy for an extended time and the pipe cleaners can be used for other things (make jewelry, letters, shapes, chains, threading,…). Age attempted: I can’t remember exactly when I first introduced this; I know my neice is able to do it at 12 months right now. Try Again? He is still intrigued at 23 months! I made the activity more difficult as he got older. Here’s the cuter version I made for my neice. I just punched holes into the top of an Empty Puffs container. J got a great gift from his Aunt… colorful bean bags!! I’m so excited to use them for lots of fun! This is my first official activity using them. 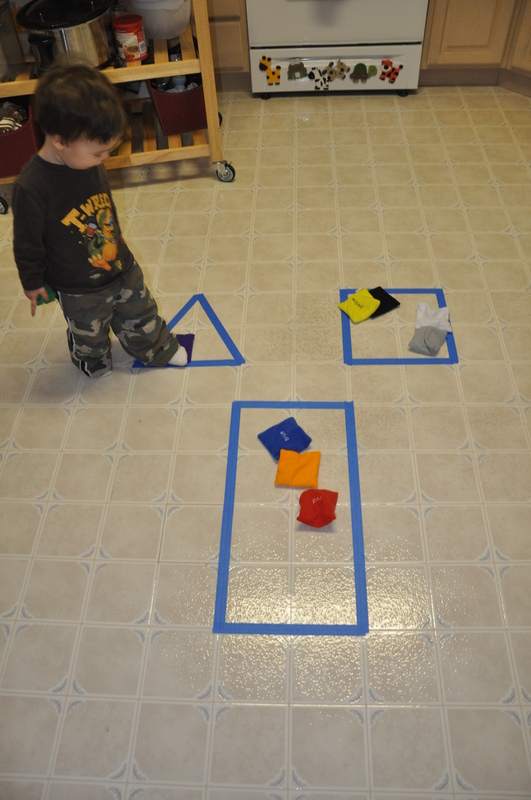 I used painters tape to create various shapes on thekitchen floor, in this case a square, triangle and rectangle. We’re currently emphasizing the rectangle in our house since it’s one of the basic shapes that J hasn’t consistently recognized yet. I chose the triangle and the square because he’s better as those (adding just one unfamiliar shape at a time). As a side note – I left these shapes on the floor for a full week. They’re very convenient! If you need your toddler contained for a bit, “J, sit on the square! Eat your snack in the rectangle!” It gives them obvious boundaries and helps them easily understand what you’re asking of them. Try Again? Yes, maybe different activities using the floor shapes. This is a great first attempt at gluing. It went better than using a glue stick actually. I just put a small amount of glue on a paper plate and showed J how to dip the cotton ball into the glue and then onto the paper. The cotton ball is the perfect size for his hand. He doesn’t end up with glue all over his hands with this activity. This first time I had J glue cotton balls wasn’t too creative. I was really just filling time with an idea in the back of my head (I think it was from the Toddler Busy Book). As you can see with our example, it isn’t too impressive. 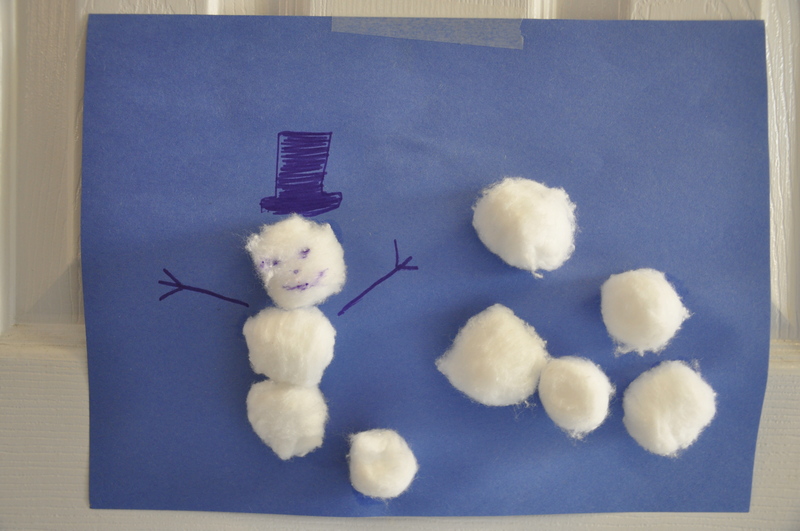 It has been snowing outside earlier that week, so I told him we were going to make a snow picture. That was enough for J. 🙂 It was simply good practice for him, but not necessarily a project to frame. Please don’t laugh at my snowman. I just decided to show him how to stack three snowballs on top of each other, to create a snowman. I grabbed the nearest marker and quickly added a hat, face and arms. He was impressed. God bless this child who loves mom’s poor artwork! Age attempted: around 19 months I think; I definitely could’ve tried this at an earlier age. Teachable Moments: I didn’t really capitalize on this! I just focused on teaching him the purpose of glue and how to correctly use it. Future Potential: Have him glue the correct number cotton balls next to the number fo the day. Have him fill a shape (work on inside/outside; filling) with cotton balls; clouds at the end of a rainbow, hmmm… that’s all I’ve got!